WOW! I have been so overwhelmed with what I should and should not use during pregnancy. I am 10 weeks and PETRIFIED to use anything. Is the Burts Bees or Aveeno brands safe? Also, what about mascaras? I've been using ROC w/ retinol under my eyes, but have stopped since I found out I was prego. I'm also scared to continue using my favorite Vaseline Intensive Care lotion because it contains all the parabans they say to stay away from. Someone help me..PLEASE! Am I the only one who really, really hates it when people say "Preg-O"? This is really helpful. I really didn't realize all of this stuff was in these products! VERY scary, I'll probably be paranoid the whole time. I've unintentionally stayed away from these products throughout my pregnancy. Yay! I know to stay away from chemical sunscreens and stick with physical blockers. i'm not pregnant, but it seems like literally everything someone would use on an everyday basis is on here. i'm sure some products are better than others to use, but are people using that much of a certain product that it could be absorbed by the body that fast??? 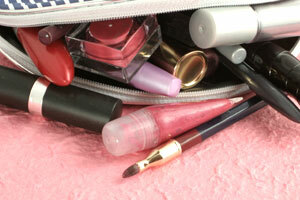 Quiz: Is Your Makeup Bag a Mess?